You are here: Home / Photography / Will “Going Pro” Help You Make Money From Your Photography? 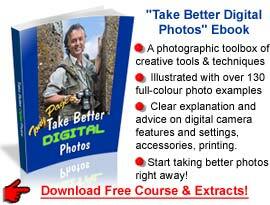 This latest eBook "kit" Darren Rowse has just put out under the Digital Photography School banner is a bit different from his previous ones, in that the main ebook isn’t written by a photographer. Yes, it purports to tell you how to "Go Pro" but it does it from "the other side of the tracks", the marketing point of view. This may be of interest to you (or it may not, read on to find out or bail now to save yourself suffering my prose), but does it do the job? 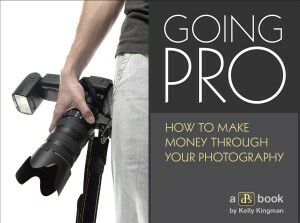 Called "Going Pro – How To Make Money Through Your Photography", this book is essentially about marketing your stuff. It doesn’t cover the nuts and bolts of setting up a photographic business, or go into any technical aspects of a particular pro photography field. What it does do is talk about making money from your photography by giving you info on where and how you could sell your services or images. It deals purely with the US market, and the resources are US references. However, the general principles and ideas would be applicable to many other developed countries, and on the whole it gives a fair, if basic, summary of the various options and techniques you have for marketing your photographic skills. 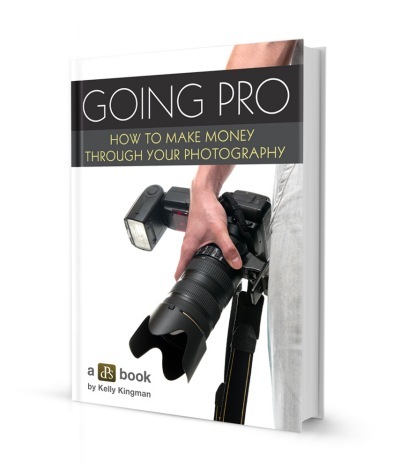 Going Pro – How To Make Money Through Your Photography (yep, that’s an affiliate link, I get more this time, about US$12 if you buy the book, but I suggest you read my review first to find out whether you should). Going Pro: How To Make Money From Your Photography (91 pages in all) to help you sell your images the way you want, by Kelly Kingman, who has been a magazine photo editor, and is a published writer on food, art and culture. 2 hours of Audio downloads of interviews with pro photography marketers Susannah Conway, Charles Borst, Suzanne Sease and Christina Villaflors. Getting Published in Photography Magazines, a 28-page practical primer on getting your photos published, by pro photographer Mitchell Kanashkevich. Note: I only got a review copy of the main Kelly Klingman book, so my comments only cover that, not the other two items. So should YOU consider buying "Going Pro"? At the 40% reduced price of US$29.99 (regular US$49.99) during the two week launch period, this package is more expensive than Darren’s usual products: so is it worth it? Well, my answer to that is, it depends (yes, I know, you’ve heard that before). First, the practical details. Starfish Blue did a good job on this book; it’s well laid-out with attractive typograhy, and easy to read columns in a landscape format that prints out OK in letter or A4 size should you prefer a hard copy. Personally, I’d prefer a cheerier colour scheme, but that’s just me. Not so many photos to swoon over, but frankly they’re not the focus of the book. The strength of this book lies in its interviews and well-written research. Kelly Klingman – who advises on producing eBooks – has put together a very readable summary of the various ways you might be able to turn a shekel or two from your photographic skills. If you go through it you’ll get a fair idea of the basic requirements and marketing techniques you’ll need to master to get a start in the various areas she covers. These are, in differing levels of detail: Editorial, Photojournalism, Commercial, Wedding & Portrait, Fine Art, Stock, and other fields like workshops, tourism and graphic design. Kelly writes that "Going Pro is about finding out who wants your work and how to get it in front of them". To a degree, yes. 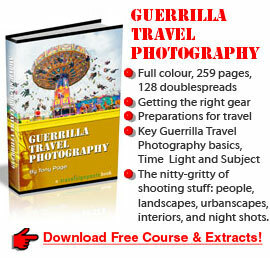 You’ll benefit most from this book if you have little or no experience of the photographic industry. 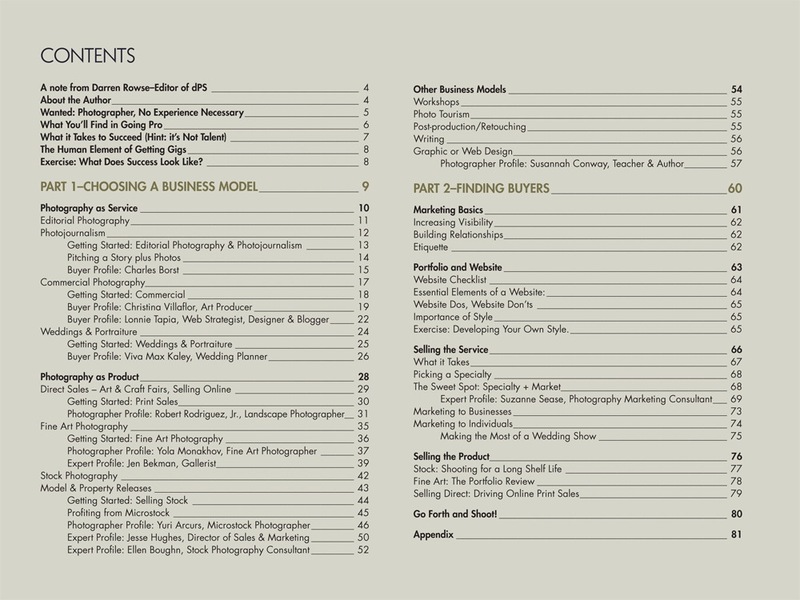 Even if you don’t live in the USA, the book will give you a good overview of the business of marketing your images and skills; there is a lot of worthwhile, solid advice here. And the insights from the various interviewees are interesting even if you are already working professionally. If you think it may be of interest to you, I’d say go with it. 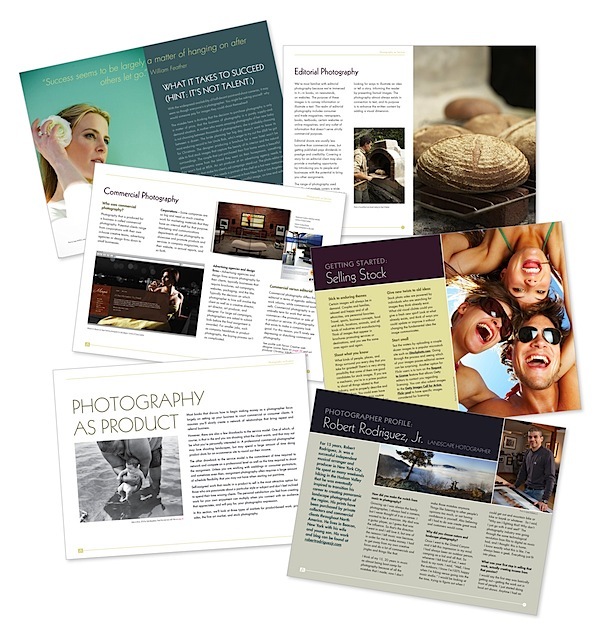 The information Kelly has put together will definitely be useful to you if you’re seriously thinking of earning some cash from your photography, and provides a more realistic approach than other "going professional" advice I’ve seen. This book will probably go down well with most DPS readers, because while they might not consider becoming full-time pros, they’d still like to earn something from their photography, and this book will give them a fair idea of what it’s all about. The sections on stock and editorial photography, and the fine art discussion, will probably seem the most relevant, but you should also check out the portraiture chapter for ideas. 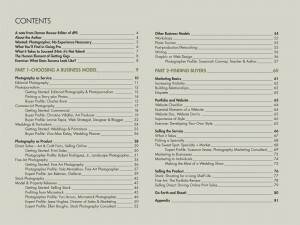 Here’s a shot of the contents page. As you can see, there’s a lot of ground covered, so don’t expect tremendous depth in any one field. But this information is based on experience, as evidenced by the interviews, and there are plenty of gold nuggets lying around waiting for you to pick them up. It’s got 75 pages of content with a 10 page appendix of relevant USA resources and links (although quite a few are useful for non-US residents). Don’t buy this book for the photos. They’re mainly there to break up the text. This book is NOT about the photos, it’s about the information served up between them. If you’ve read my comments above, you probably already have a good idea whether this eBook is for you. Even though I have had a career as a professional photographer, including travel photojournalism, I still found Kelly Klingman’s book an interesting read, and I know that the information and advice she and her interviewees provide is pretty much on the money (if you’ll excuse the pun…). But there’s a lot more to the actual practical reality of becoming a professional photographer – no matter which field you choose – than you can learn from a book. Having said that, I realize I’m talking about working as a full-time professional, whereas many people considering buying the "Going Pro" kit will be thinking more of an additional part-time income. In that respect – although some of my fellow professionals might disagree – I really believe that with a good dose of determination, appropriate skills and a bit of luck, someone who reads this book and puts some of its recommendations into practice will be able to make some money from their photography, especially in the editorial, portrait, fine art and maybe stock fields. Local businesses (like real estate) might also be useful prospects. But one caveat: make sure you’re confident about your technical skills before you start, otherwise you’ll buy into a whole lot of grief and nervous stress. Kelly Klingman writes that "This eBook is based on the conviction that if you hone your skills and commit yourself to building a strong body of work, you will find a market for the types of images you love to create". Well, maybe. But just because you like taking certain types of shot doesn’t mean that somebody’s going to pay you to do it. And we should never forget the "working" in "working photographer". When you "go pro" (or even "part-time pro") it’s a job, not a hobby. It takes a lot of determination to succeed, and talent is not enough. Anyone who makes it at any level deserves respect; could it be you?